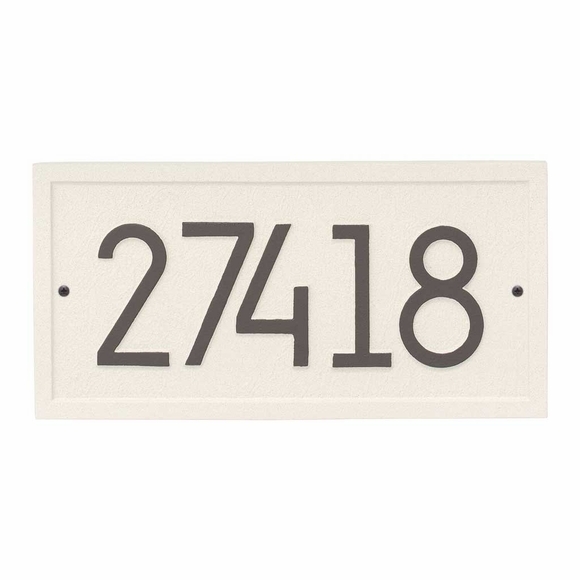 Modern Rectangle Address Plaque - - meets 911 codes. Crisp Modern Font 4" numbers are easy to read. Wall mount. Made in USA. Personalized sign holds five (5) large 4" numbers. Protected from weather elements with Alumi-Shield™ All Weather Coatings and suitable for all exterior locations. Large image shown in coastal clay color. Smaller images (from left to right) are aged bronze, black/silver, coastal green, oil rubbed bronze, pewter/silver, and white/black. Dimensions: 14.75"W x 7.5"H x .325; weighs 2.25 pounds. Rectangle Address Plaque meets 911 codes. Crisp Modern Font 4" numbers are easy to read.